American writer of experimental novels, who lived long times in Mexico City, Tanger, Paris, and London. Burroughs’s homosexual themes in THE NAKED LUNCH (1959) and the frankness with which he dealt with his own experiences as a drug addict sparkled the last major obscenity trial in U.S., but won him a following among writers, musicians, and film makers. Burroughs produced the bulk of his writing after he moved to London and took an apomorphine cure under the direction of Dr John Dent. William Seward Burroughs II was born in St. Louis, Mo. into a successful business family. His mother, Laura Lee, was a direct descendant of Robert E. Lee, his grandfather the inventor of the Burroughs adding machine. The Burroughs Corporation ultimately merged with the Sperry Corporation to create Unisys. By the time of Burroughs’s birth, his father Mortimer had already sold his stock in the company. After six years at the private Community School, Burroughs sent to the John Burroughs School. He also spent some time at the Los Alamos Ranch School for boys. “As a boy,” he later recalled, “I was much plagued by nightmares. I remember a nurse telling me that opium gives you sweet dreams, and I resolved that I would smoke opium when I grew up.” At the age of 14, he read Jack Black’s You Can’t Win. This autobiographical account of hobo life had a profound effect on his world view and later influenced The Naked Lunch. Burroughs graduated in English literature from Harvard University in 1936. During this period he lost his heterosexual virginity in an East St. Louis brothel. However, he had also recorded his homosexual fantasies in a diary at Los Alamos. Burroughs traveled in Europe, where he studied medicine in Venice for a year. While in Austria he married a Jewish woman who wanted to escape the Nazis. After returning to the United States Burroughs studied anthropology at Harvad. In the early 1940s he lived in New York City and worked for an advertising agency. When the war began, Burroughs joined the army. He was trained as a glider pilot, but was discharged as unfit for service in 1942. The major reason was his relationship with a hustler named Jack Anderson. Burroughs had amputated one of his little fingers after Anderson left him. Rejecting his background, Burroughs plunged into an alternative life-style that included drugs, odd jobs, and bisexuality. While working in the shipyards of New York, he became addicted to heroin, or what he called Opium Jones, G(od’s) O(wn) (Medicine). Drug addiction was not new in the family. Burroughs’s uncle Horace used morphine. He committed suicide in 1915. Burroughs lived for a time in Tangier in a male brothel. Ginsberg and Kerouac visited Tangiers in 1957. In 1959 Burroughs published The Naked Lunch, which is now accepted as a modern classic. Much of its structure was planned by Allen Ginsberg, who gathered the scraps of paper that he found scattered around in Burroughs’s room. The book consists of twenty-one satirical pieces that purport to lay bare the horrors of reality: hence the title. “Let them see what they eat.” It featured such characters as Dr Benway, a mad scientist dedicated to Automatic Obedience Processing, and the Lobotomy Kid, who manufactures the Complete All-American male, a blob of jelly. First the work published by Olympia Press in Paris, In England it appeared in 1964, as part of DEAD FINGERS TALK, an amalgam which also included THE SOFT MACHINE and THE TICKET THAT EXPLODED. The nightmarish visions of William Lee, a junk addict contains science fiction, biological fantasy, disgusting images, and sick jokes. “May all your troubles be little one, as one child molester says to the other.” (from Naked Lunch) It also tries to find from the use of drugs and homosexuality a philosophical statement – addiction is seen as a metaphor of the human condition. The plotless novel was a tough challenge for the Canadian film director David Cronenberg, whose science fiction films often deal with biological mutations. “Given an impossibly difficult text to film, Cronenberg made an excellent decision to avoid the kind of ponderous, literal (mis)reading of a classic American novel that marks, for instance, Joseph Strick’s Ulysses. Instead, he used the entire Burroughs opus and the legendary biography as the interpretation for his film that became a brilliant response to the novel, rather than an adaptation per se.” (from Novels into Films by John C. Tibbetts and James M. Welsh, 1999) Cronenberg added in the film scenes from Burroughs’s life, accidentally shooting of his wife, literary friends who have much similarities with Ginsberg and Kerouac, and an American expatriate couple, referring to Paul and Jane Bowles. In the 1970s Burroughs returned to New York, where he got hooked on heroin again. Eventually he settled in the small university town, Lawrence, Kansas. In 1983 Burroughs became a writer in residence to the university and devoted to his spare time to a vegetable garden. 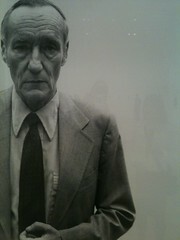 His last years Burroughs lived with cats and handguns and rifles. He also exhibited ‘action paintings’ produced by taking potshots at tins of paint. Burroughs died of heart failure on August 2, 1997, in Lawrence. In his works Burroughs developed with painter Brion Gysin a ‘cut-up’ method, that employed cutting and blending several random texts into one hybrid narrative. Thus Burroughs has attempted to avoid conventional language patterns and to restructure readers consciousness. He began writing in the 1930s, but his first book, JUNKIE: CONFESSION OF AN UNREDEEMED DRUNG ADDICT, was published in 1953 under the pen name William Lee – he did not want to upset his parents. Part of the sequel, QUEER (1985), Burrough wrote already in 1952. The book was not published until decades later due to its homosexual content. The Naked Lunch was completed after Burroughs’s treatment for drug addiction. Other works include The Soft Machine (1961), NOVA EXPRESS (1964), and THE WILD BOYS (1971). Christopher Isherwood proclaimed Burroughs’s CITIES OF THE RED NIGHT (1981) as a masterpiece. Although it mixed a virus plague and CIA with a missing boy, intergalactic conspiracy, and an eighteen-century pirate captain, it is considered one of Burroughs’s most coherent novels. However, while writing the book, he underwent several operations in an effort to close an abdominal cyst and spent much of his time and money on drugs. In the sequels of The Red Night trilogy, THE PLACE OF DEAD ROADS (1983), a western where cowboys are gay, and THE WESTERN LANDS (1987), Burroughs also depicted a deadly virus plaguing humankind, “inexorably headed for extinction”. THE YAGE LETTERS, which was published in 1963, was based on Burroughs’s travels through the Amazon region of South America in search for the drug yage, the notorious “final fix”. The Wild Boys was set in the year 1988. Adolescent guerrilla packs of specialized humanoids are routing the forces of civilized nations and ravaging the earth. When wholesale slaughter erupts, the battle continues underground where the survivors evolve into The Wild Boys, hordes of pitiless homosexual warriors who move in and destroy the cities. Burroughs has warned of the “Control Machine”, forces of conformity that would destroy the unique qualities of the individual. In Nova Express and The Ticket That Exploded they are agents from other space and a virus from Venus. Material for his novels the author has borrowed from all areas of popular culture. In science fiction his influence can be seen in the works of J.G. Ballard, Michael Moorcock, John T. Sladek, Norman Spinard, and others. Overt pastiches of his works include Barrington J. Bayley’s The Four-Color Problem (1971) and Philip José Farmer’s The Jungle Rot Kid on the Nod (1968).Apart from the bands (Soft Machine, Dead Fingers Talk), which took their names directly from his works, David Bowie, Debbie Harry, REM, Nirvana, and others have paid homage to Burroughs. The writer is also found from the cover of the famous Beatles album Sergeant Pepper’s Lonely Hearts Club Band (1967). Burroughs even appeared in an advert for Nike and in a strange Japanese ‘document’, which depicted the search of Albert Einstein’s brains – finally found in a class jar, owned by a downhill scientist. In Drugstore Cowboy Burroughs acted Matt Dillon’s elder brother. His other films include Twister and U2 music video Last Night on Earth. Burroughs recorded with Laurie Anderson, Kurt Cobain, and Michael Stipe. He has been awarded the honour of inventing the music term “heavy metal”.